Are Albino models the next BIG thing in fashion? Meet 2 women defying the odds! Did you know that in some African countries, people with albinism live in constant fear of being abducted or mutilated? Especially in East Africa, there is a myth that their body parts make potions and rituals more powerful. You know, I am all about culture but some of these myths, old wives tales and stories have got to go. It saddens me that in 2012 people still sadly believe these inaccuracies about albino people. I want you to meet two women that are on a mission to change the disturbing stereotypes of what it means to be an albino. Supermodel Diandra Forrest and South African stunner Refilwe Modiselle were born on different continents but the gorgeous beauties share a common goal of changing the face of fashion, one albino model at a time. While primping backstage at South Africa fashion week, American born model Diandra spoke to BBC News about the significance of her visit and work in Africa. "It matters a lot to me to be here, because I want to change the way people see girls with albinism on the continent." 26 year old Refilwe Modiselle is widely credited as the first working albino model in South Africa. Baby girl was recently selected as the new face of clothing brand Legit's summer collection. Speaking about her monumental feat Refilwe says " The rules that defined what a 'normal' girl should look like have been broken. I'm glad Legit picked me because it's taken fashion to another level. That they chose to do something different shows how feisty the brand is." 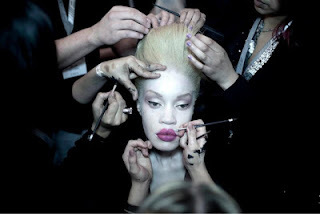 Now, I know you may be wondering 'well this may be nice and all, but what do 2 albino girls in fashion have to do with the plight of albino people in Africa?'. According Peter Ash, the author of a 2012 report on albinism, change can start in the seemingly superficial world of fashion. "The main problem we find is that there is an underlying acceptance of violence against people with albinism, because they are seen as sub-human, a representation of the devil, or carriers of a curse. The more positive portrayals of people with albinism the better: it really helps". I just hope that isn't some sort of fad, you know how fickle fashion folks can be. What's in today is gone tomorrow. Let's hope we can keep this educational train moving all over the world.. Thoughts on the albino models? Do you think their success will have any kind of lasting impact?